Friendship bracelets have certainly stood the test of time, but the styles have changed a little. 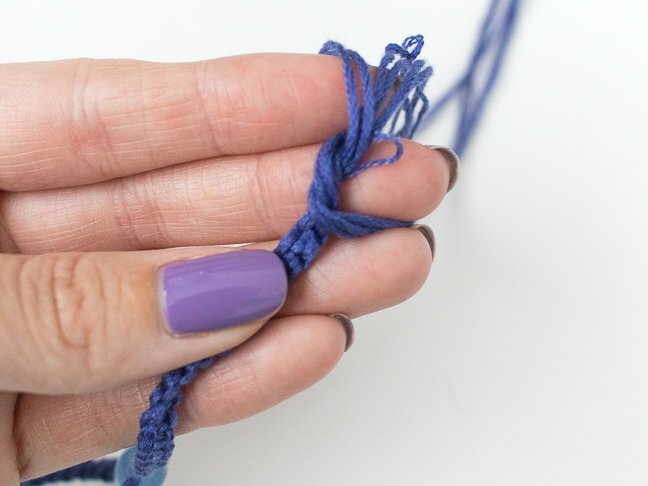 Now, rather than simple braided bracelets, macrame is trending, and you can use basic techniques to DIY simple macrame bracelets with beads and colorful threads. 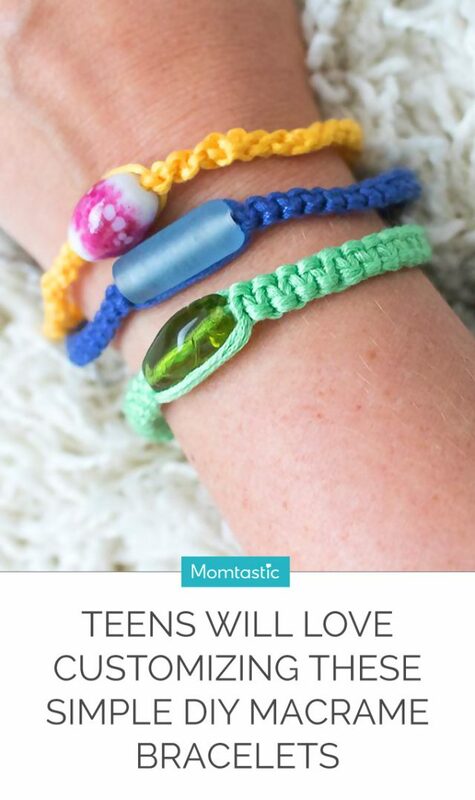 Teens will love making these macrame bracelets for their friends, but moms can enjoy them just as much. 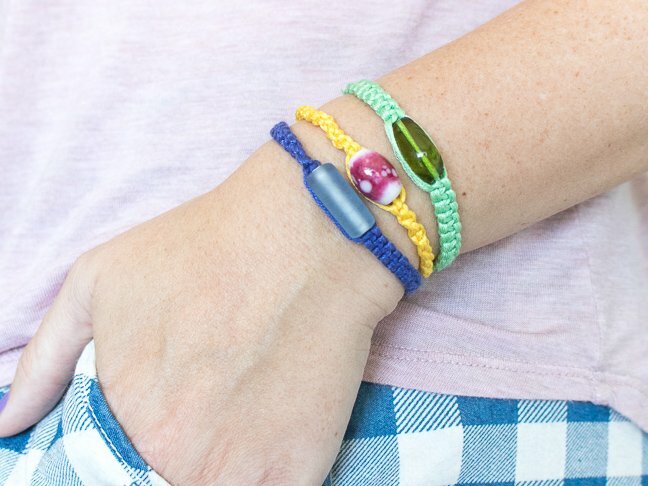 Make them with any colored string and combine unique beads for simple but pretty bracelets that can be layered. They look complicated, I know. 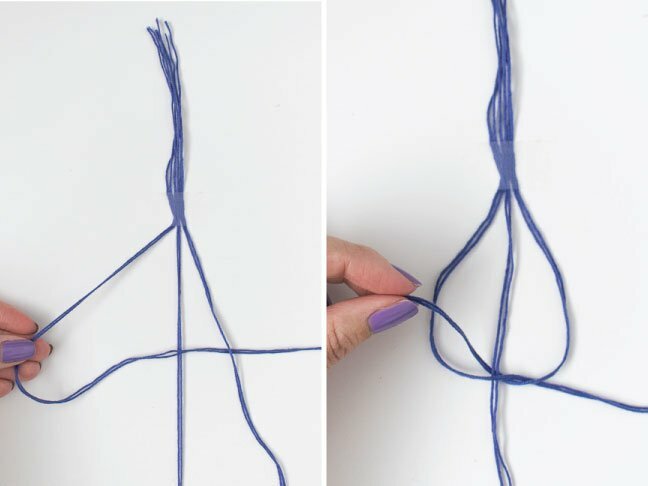 But honestly, if you can tie a knot then you can master macrame! 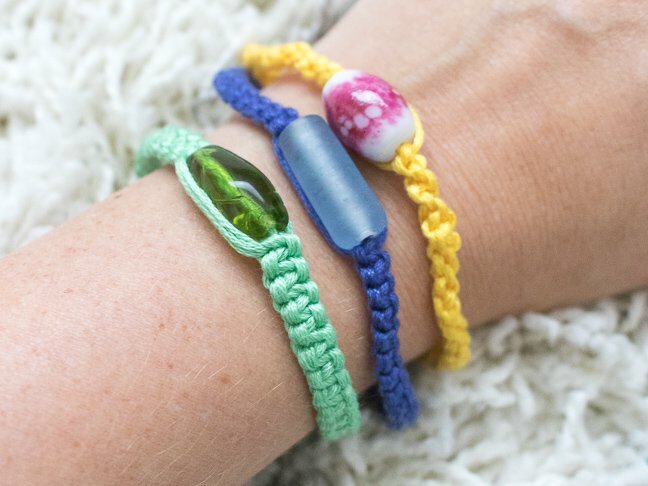 These macrame bracelets only use one type of macrame knot, the square knot. 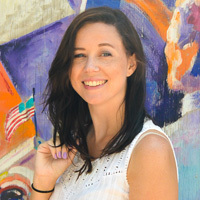 It’s the most basic knot but creates a strong braid, and you can still switch it up with different thicknesses and even a spiral. Of the three bracelets I made, one uses a 6-string square knot (the blue one), one uses an 8-string square knot (the green one) and one uses a spiral knot (the yellow one). This type of macrame is very easy. After a few knots, you’ll get the hang out of it and feel like a pro! 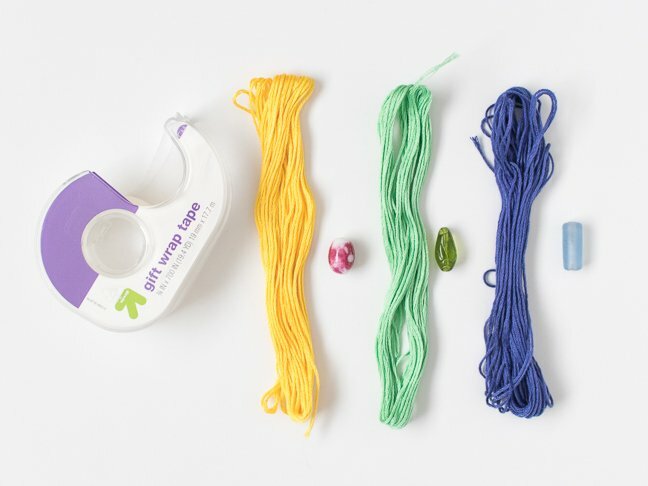 Keep playing with different thicknesses, colors and string types, and each macrame bracelet will look very unique! 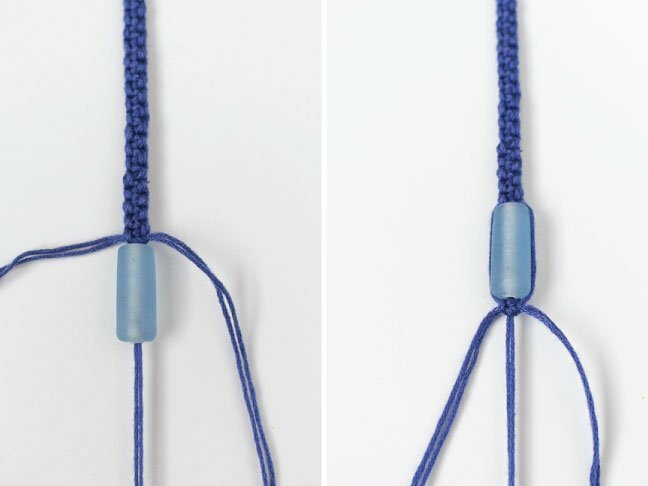 Note: These instructions are for the blue bracelet, a six string square knot macrame bracelet. To make the green one, simply use eight strings instead of six. To make the yellow bracelet, only create the left side of the square knot and a natural spiral will form. 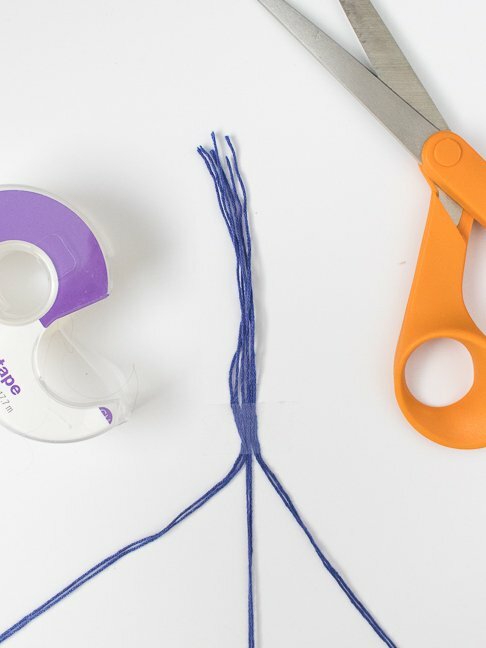 Step 1: Cut six pieces of embroidery thread about four feet long and gather them together. Leave about 3 inches at the top and tape down to a table. This will make it easier to knot. Step 2: To make the square knot, separate the strings into sets of two. The middle strings will stay in place, and the left and right strings will be used for the knots. Step 3: On the left, cross the string over the middle and under the right string. 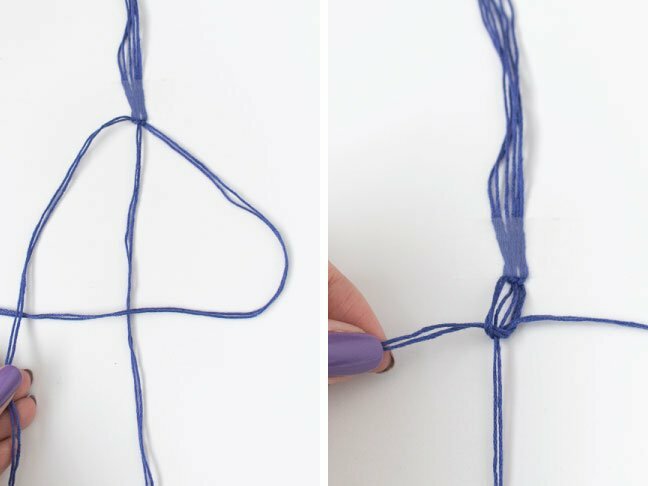 Then pull the right string under the middle string and through the opening to create a knot, pulling it to meet the tape. Note, you can start on the left or right side – whatever feels most comfortable. Step 4: Repeat with the opposite side to complete the square knot. Repeat until you have about 3 inches of knots. Step 5: Thread a bead on the two middle strings and push up to meet the knots. Step 6: Continue creating knots below the bead until you have another 3 inches of knots. Step 7: Remove the tape. Wrap all 6 strings into a knot to secure both ends of the bracelet. 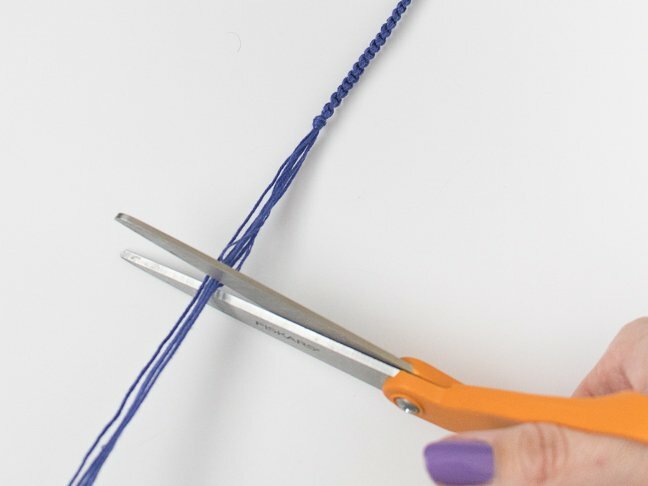 Step 8: Trim excess strings from either side but leave enough so that you can tie the bracelet around your wrist.